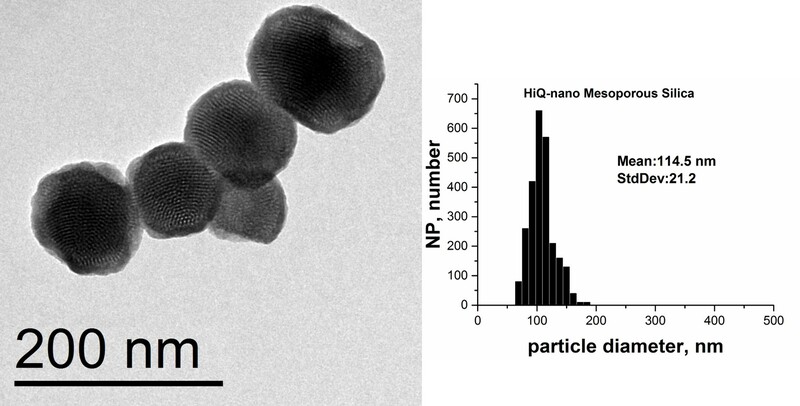 Highly porous silica nanoparticles with size distribution ranging from 115 to 160 nm. HiQ-Nano Mesoporous Silica Nanoparticles have a hydrophilic surface with terminal Si-OH functional groups and are stable in organic solvents and aqueous buffers. Our nanoparticles are very competitive in relation to the quality. Feel free to contact us for specific inquiries, technical questions and quote requests. Furthermore, we will be happy to provide a wide range of customized nanoparticles to meet your specific demands. HiQ-Nano is a nanotechnology oriented company arisen from Italian Institute of Technology, focused on the design, fabrication and characterization of high-quality nanoparticles. The company exploits its strong scientific expertise in nanofabrication, nanobiotechnology and material science to satisfy the demanding needs of both academic research and industrially oriented applications. 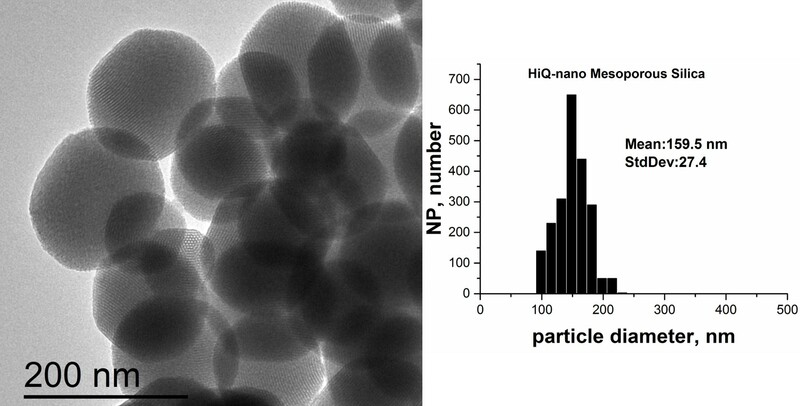 HiQ-Nano provides highly monodispersed and stable nanoparticles, with a low batch-to-batch variability, accurately characterized for their shape, size distribution, charge, and agglomeration state. Our mission is to guarantee excellent nanoparticles and related technologies to our clients, allowing researchers and industries to face with the exceptional properties of nanomaterials.